Backpacking rain gear is an important piece of equipment to consider when planning a trip. While most would hope for endless blue skies, eventually you’ll encounter that lovely precipitation. So, as opposed to getting cold, wet and cranky, be prepared! Breathable - it’s important for perspiration to be able to evaporate. You also want to be able to stay cool on hot days. Make sure your rain gear as some way for air to get in and out. For example, vents in the armpits. Lightweight - since this is a more heavy duty item of clothing, pay attention to the weight. There is no need for this piece of gear to add too much weight to your pack. Waterproof - there is a difference between waterproof and water resistant. Waterproof means it is a garment made from fabric that will not let water in. Water resistant means the material has been treated to repel water, but it will not prevent it from soaking in. If you want this to keep you dry even through a downpour, be sure to go for a waterproof material. Durable - how durable your gear needs to be depends on what kind of backpacking you plan on doing. If you plan on doing a lot of bushwhacking, you’ll need very durable gear. Typically, more expensive = more durable. 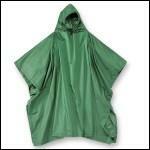 The Poncho - breathable by design, this is a very light and relatively cheap option. The main drawback to the poncho is that it does not work very effectively in the wind. And most storms are accompanied by wind. With just a little wind, you’ll end up with that poncho whipping up in front of your face and exposing your body to the elements. This should only be used if you know you’ll be in light rain with little wind. The Rain Suit – this includes a rain jacket and rain pants. This will be the weightier of the options since it has more pieces, but will keep you protected from the elements. Again, there isn’t much breathability, but it will keep you warm. The problem with rain gear is that there is no perfect answer. The type of backpacking trips you take will make a difference in what will work for you. Ultimately, like we mention above you will want something that is waterproof and breathable at the same time. This can be tricky. A poncho is very breathable, but can’t stand up to too big of a storm. And while a rain suit might keep the water out, you can end up soaking yourself with your perspiration. So if you’re just going to get wet anyway, why not save a few bucks and ounces and go without. Well, you have to remember the important difference that rain gear makes is that while it might not keep you completely dry (since your sweat can’t get out very well), it will keep you warm. And that is vital. What’s neat though is that there are some materials that are designed to be waterproof and breathable at the same time. Gore-Tex is one of these miracle materials. It’s designed to allow your body’s perspiration to evaporate and exit the suit as a vapor, while keeping water from the outside coming in. While effective, it does have its limitations. And it’s expensive. But in the end, it’s probably the best option out there for your backpacking rain gear.